Have you ever wanted to work in a beautiful, remote location in the Top End? 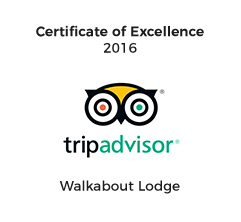 The Walkabout Lodge and Tavern offers excellent working conditions including accommodation and meals as part of the overall employment package. Assistance with airfares is also offered. The Walkabout Tavern has a public bar with gaming machines, a Nightclub (open Friday and Saturday nights), Bottleshop and TAB facilities. Applicant would need to possess relevant industry experience, staff supervision would be highly regarded. The applicant needs to hold an NT Gaming Licence and a Responsible Service of Alcohol Certificate. Applicants would need superior communication skills, have a desire to learn, proven customer service excellence and impeccable presentation and grooming. Experience in hotel reception is desirable and knowledge of Starfleet, our reservation system, would be an advantage but not essential as training is available. Applicants would be required to have excellent customer relation skills, a commitment to supply a high standard of customer service, excellent presentation and grooming as well as the ability to work split shifts to cater for lunch and dinner dining. It is desirable that applicants have relevant industry experience (but not essential as training is available), possess a Responsible Service of Alcohol Certificate or be prepared to obtain this. Applicants would ensure food and presentation standards are met as outlined by our Head Chef and would assist in production of food according to demands of guests and seasons. You would also support correct quantity of operating supplies for the restaurant, and timely supply for tavern, functions and staff as specified. Excellent presentation and grooming and the ability to work unsupervised in a team environment is essential. Experience and/or a relevant qualification in a similar role are highly desirable. Applicants would require excellent organisational and communication skills, have a competent background in IT, a desire to learn, impeccable presentation and grooming and the ability to work unsupervised in a team environment. Relevant office experience and knowledge of MYOB is essential, familiarity with our hotel reservation system, Starfleet, would be also be an advantage. Applicants would be required to work in our Tavern and Nightclub and must have an NT Crowd Controllers license, or prepared to have NT endorsement. A recent work history in a customer service field is preferred. Applicants would be responsible for sanitary maintenance of all the food preparation areas, kitchen equipment and restaurant tableware, as well as support chefs with timely restocking/storage of supplies. Excellent presentation and grooming and the ability to work unsupervised and in a team environment is essential. Applicants would be responsible for general maintenance work and yard upkeep, as well as stock and inventory movement in and around the Lodge and Tavern complex. Experience in woodwork, metal work, plumbing, and gardening, etc. is desirable, a forklift licence would be an advantage. The ability to work unsupervised using correct occupational, health and safety practices is essential. Applicants would be responsible for maintaining a high standard of cleanliness and hygiene throughout the Lodge and Restaurant facilities, work unsupervised in a team environment with early starts and be available for weekends shifts. Experience is preferred but training is available. Explore the unique landscapes of East Arnhem Land, the magnificent waters around the Gove Peninsular and the culture of the Yolgnu people.r.